At the age of 15, Louis became Leonard Bernstein. As a child, Leonard was always interested in music and was frequently taken to concerts. He began to play piano and attended the Garrison School, Boston Latin School, Harvard University, and the Curtis Institute of Music. In his life, Bernstein accomplished a great deal. When "West Side Story" came to life, his career skyrocketed. Shakespeare's "Romeo and Juliet" has been a classic love story for hundreds of years. In 1957, the classic masterpiece of love, death, and fury was given a new flare. 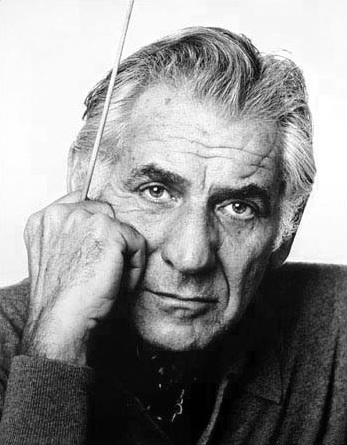 Leonard Bernstein composed the music for the cast of main characters. With a plot similar to "Romeo and Juliet," the musical amazed audiences worldwide. Arthur Laurents wrote the book. Bernstein composed the music, and Stephen Sondheim created the lyrics for Bernstein's music. The love story is set in 1950's upper west side Manhattan. The plot, similar to Shakespeare's infamous love story, surrounds two gangs. A member of each gang falls in love. Tony, who is a Manhattan gang member, falls in love with Maria, a Puerto Rican gang leader's sister. Like Shakespeare's "Romeo and Juliet," "West Side Story" illuminated themes of juvenile delinquency, but the delinquency was represented through the gang wars and mischief instead of rival families. The music by Leonard Bernstein from the play has become quite popular over the last 51 years, especially with the 1961 release of "West Side Story" the film. Bernstein's most famous numbers include the following: "Maria," "America," "Somewhere," "Jet Song," and "I Feel Pretty". Starting on September 26, 1957, "West Side Story" was performed 732 times prior to going on tour. It was nominated for Best Musical in 1957's Tony Awards, but it did not win. However, the Tony Award for Best Choreography did go to "West Side Story" that year. 2008 marks the 50th-anniversary revival of "West Side Story." The revival begins July 22 at Sadler's Wells Theatre in London. While the original cast will not be performing, the new cast is eager to perform this amazing play, which has been staged in numerous theatres and opera houses all over the world. Another revival is set for Washington, D.C.'s National Theatre and in mid-December. National tours for "West Side Story" have crossed the United States, the United Kingdom, Hong Kong, Australia, Israel, and Africa. Adaptations of the play have also been written. Philippe Gobeille presented a French version of this play in 2008 in Quebec and a Philippine version is scheduled to begin performances in September 2008. References to "West Side Story" and many of the musical pieces in it have influenced many facets of music and culture. "I Feel Pretty" has been featured in the films "Anger Management" and "Dirty Dancing." References to the play can also be exhibited in "Analyze That," "Shrek," Michael Jackson's "Beat It" music video, Saturday Night Live, and Friends. References to the play can also be heard in modern music. Santana's "Maria Maria," Kiss's "Hide Your Heart," Metallica's "America," Dire Straits' "Romeo and Juliet," and Alice Cooper's "Gutter Cat vs. the Jets" all have ties or references to "West Side Story." Bernstein's legendary music will remain a staple of pop culture for centuries to come. A free email newsletter on exciting piano chords and chord progressions from Duane Shinn is available free at Exciting Piano Chords & Chord Progressions!